It is 2 1/2 years since I was last in Bishkek, and at Manas airport at 5am local time it felt somewhat surreal to be back. Gold teeth shone out from the mouths of the passport control guards as they looked me directly in the eye and made a detailed comparison between my bedraggled facial features and my passport photo. 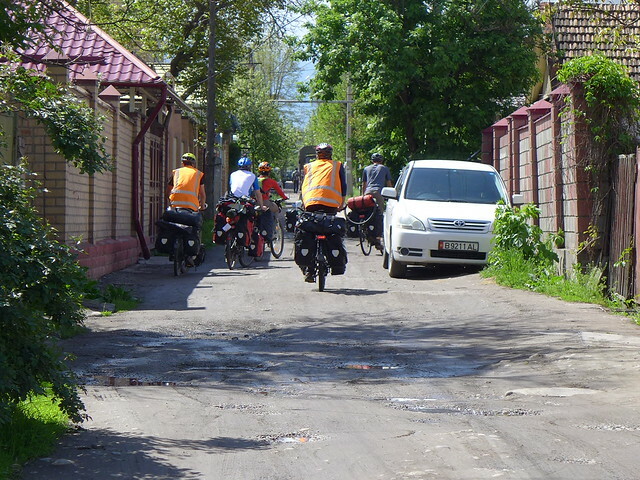 The last time I was in Bishkek in 2013, at the end of my previous ride, Carra (my old bike), was seemingly held together with cable ties and gaffer tape and had recently suffered 3 broken spokes. 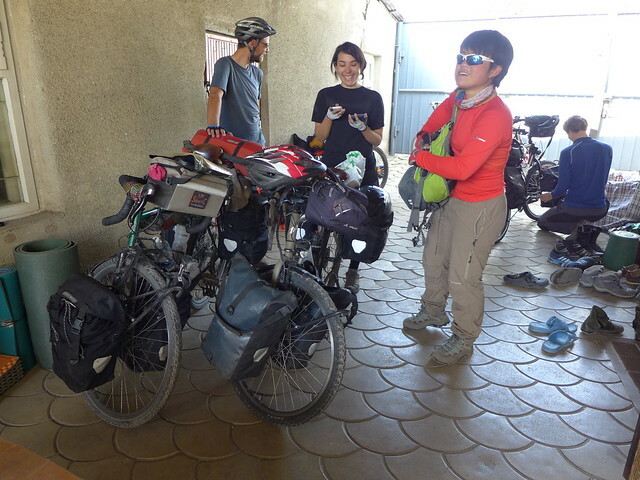 I was not faring much better having cycled 7,500km, spent far too long acquainting myself with Central Asian toilets and braking a tooth a week before making it to the city! The equally poor health of my bank account and lack of a Chinese visa all combined to close that chapter of my journey. 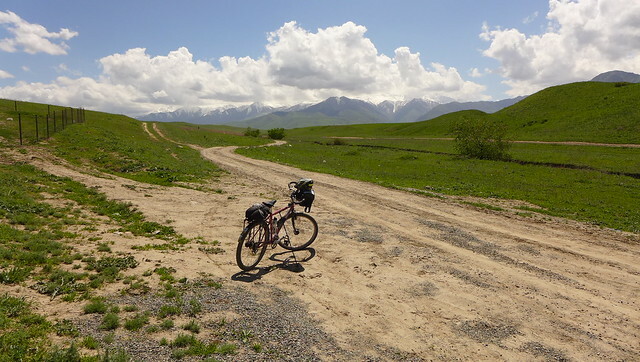 This time I was back to pick up where I had left off with a plan to cycle north through Kazakhstan, a quick stint through the Altay mountains of Russia and into the vast emptiness of Mongolia. It had taken me longer than planned to get back to Bishkek, but in mid-April I finally made my return. After spending a day dismantling, carefully packing and then vigorously taping Raven into her bike box for the journey, before wrestling her to the airport and balancing her carefully on the scales to make her look affordably lighter, I was incredibly relieved to see her arrive on the luggage belt along with all the other suitcases, looking relatively unscathed from the journey. Following a lengthy sleep and an afternoon reassembling her, there was one thing standing out at the top of my agenda in Bishkek – apply for a Russian transit visa at the consulate. 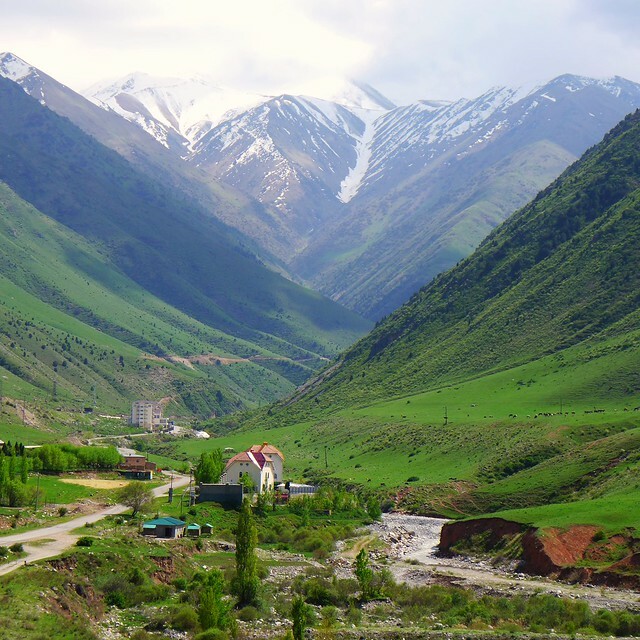 With the Chinese visa once again virtually impossible to get outside of my country of residence, the 900km stretch of road through Russia between Eastern Kazakhstan and the Mongolian border was pivotal in my journey. My brain had deleted the minimal Russian I had picked up 2 years ago and on the Monday morning I approached the security guard outside the Russian consulate and waved some papers – explaining; ‘Transit visa’ with my best Russian accent and a hopeful smile. He simply pointed to an information board full of Cyrillic script and boxes with times. Understanding that he was indicating 14:30, I said thank you and returned in the afternoon. This time he looked at me in despair and pointed to the box next to ’14:30′ with 2 words, neither of which I guessed meant Monday. Having taken a photo of the board, I headed back home to do some translating, basically visa applications are only on Tuesday and Thursday afternoon. Having finally made it inside the consulate I presented my application to an English speaking official behind a small and impossibly high window. I felt like a small child stretching on tip toes to see the sweet selection behind an old fashioned shop counter. After getting me to sign and date the application form, he told me that I could not apply for a Russian visa, transit or tourist, without tickets booked in advance across the border (tricky on a bike unless you sell yourself a ticket to ride) and a minimum of a 3 month visa for Kyrgyzstan. A crash course in days of the week in Russian anyone?! And you are going to need 2 of everything, most definitely a Russian speaker to translate, a serene false smile and a fair amount of patience as you get passed from one official to another telling you how you don’t need a visa because you have a UK passport! Having presented all of the above I was told I could collect my visa in 10 days, make that 10 working days, actually make that 3 weeks when all the national holidays of early May were added up. Only then can I get down to applying for my Russian transit visa. All this to get a visa in a country I already have a visa for, in order to get a visa for a country I will spend less than 10 days in! I had known there would be some waiting and hoop jumping required for visas here so I had arranged my Kazak visa in advance. But having failed to foresee a delay of a whole month I am going to be seriously pushed for time in Kazakhstan. Being as I have to book a train ticket to satisfy my Russian transit visa requirements, I will also be tied into a specific time and date to reach the border city of Semey. Feeling like I should be excited at hitting the road again, I am instead finding myself wallowing somewhat in frustration at the false start. To add to my growing level of apathy, I am once again surrounded by a steady flow of cycle tourists who come and stay for a few days, pouring over map and routes, before packing up their bikes and heading off again. Each farewell is tinged with envy as they wind their way past the potholes and barking dogs along the street. 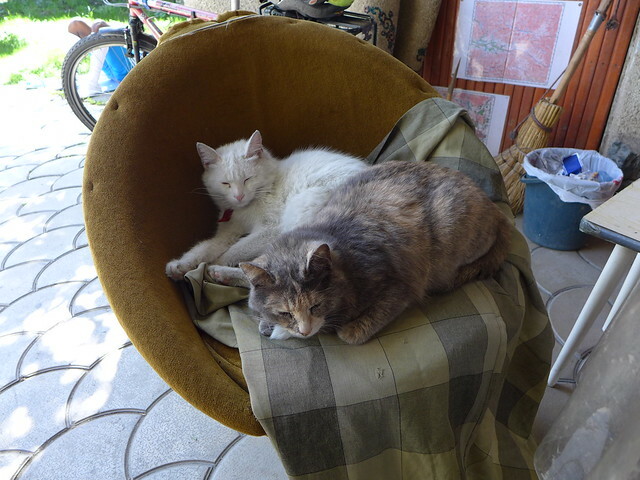 At least there are some sympathetic ears for geeky chats about bikes and kit, as well as other visa woes, and the cats are never inclined to go far. To try and blow some wind back into my sails I took a ride out of Bishkek yesterday and headed up a valley into the nearby foothills of the Kyrgyz Range, whose mountains form such a dramatic backdrop to the city. As I turned the pedals the sun shone and the sweat started to build. The gently climbing road took me out of the city past rows of shashlik (kebab) restaurants and roadside bakeries selling somsa (meat pies, almost similar to pasties) and bread from the domed clay ovens. My out-of-shape legs started to burn and as my nose did the same under the sun, houses gave way to rolling hills, and cows, horses and sheep dotted the green pastureland. 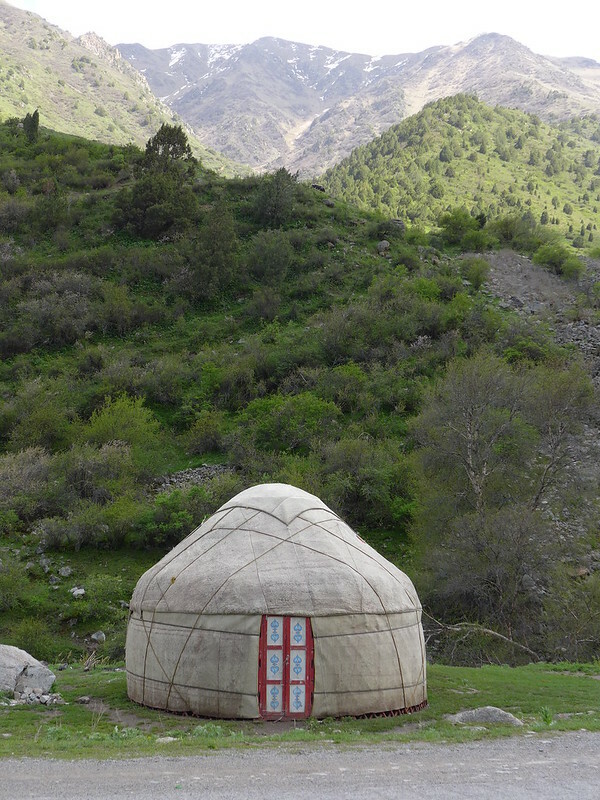 Weather-worn yurts stood by the banks of the fast flowing river as spring snow melt crashed it’s way down from the mountains and towards the reservoirs and channels of Bishkek. It felt good to be doing what I came here to do – ride my bike, but it felt terrible to feel how unfit my body was! 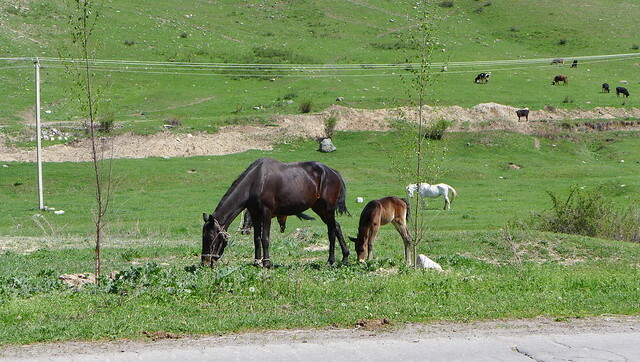 Perhaps this waiting will be a blessing as I get some training in and explore some more of Kyrgyzstan in the interim. I hope that a longer trip next week will go some way to helping me adjust to leaving special people behind again, and re-injecting that travel drug that keeps on dragging me back to these adventures. Visa frustrations, at the end of the day, are all part of it – just not the fun part. Whichever sign you read – the toilet is easy enough to find in the cinema in Bishkek. Well worth a chuckle when I attended the screening of ‘Amy’ to while away an evening. No I couldn’t get a Russian transit visa in Kyrgyzstan, even after a month of paper chasing. In the end I had to go to Almaty. Most EU passport holders get 15 days visa free in Kazakhstan and the Marshutkas go every day. Thanks for the quick reply Raz! Guess we will try it in Dushanbe then… Any idea about that? No problem. Sorry I have no idea about Dushanbe. It took 3 days in Almaty paying for the express service and I needed proof of health insurance and my train ticket in. They wanted one out, but when i explained i was cycling on to Mongolia they were fine about it.